In the 1820’s there arose from the gardens of Blickling Hall a new variety of eating apple, it was named ‘Caroline’ after Lady Suffield who lived in The Hall at that time. The trees flourished for many years but sadly dwindled in the early 1900’s until considered a lost variety. By good fortune a surviving tree was identified growing in a garden at Gooderstone near Oxburgh and thus the Caroline was saved. This tale of an apple was the starting point for a wonderful project realised in Blickling Hall during the summer of 2012. 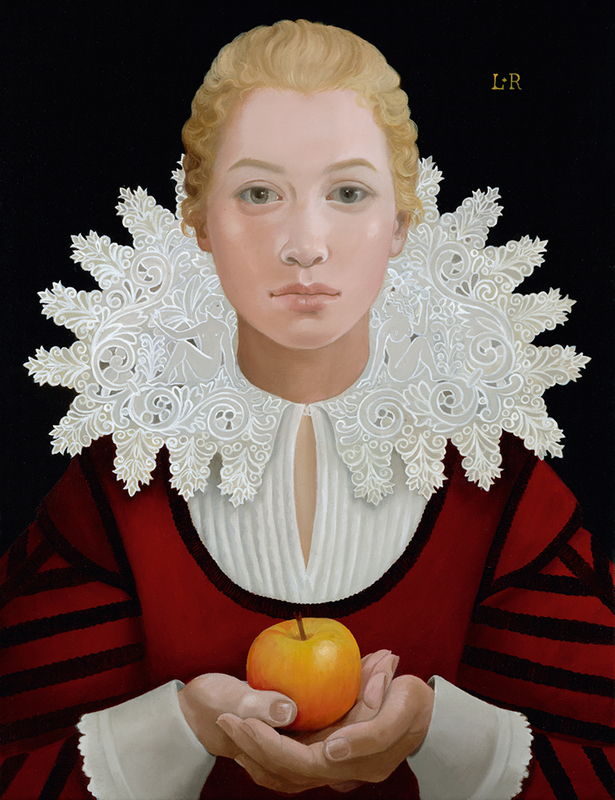 The artist Lizzie Riches created a collection of paintings which celebrated the apple itself as well as other related aspects, history and flora of Blickling – entitled ‘In Search of The Golden Caroline’ the collection of paintings included an intriguing twist in that clues were created from the panels, a beautiful gilded and jewelled apple became the quest. Lizzie is a Londoner by birth though growing up near Epping Forest gave her an enduring love of the natural world. Childhood visits to the National Gallery awakened a passion for painting and visiting Audley End at the age of five began a lifelong interest in Elizabethan Portraiture. A hopeless student at ArtSchool, Lizzie preferred to develop her own style by going back to study the paintings she had loved as a child. She joined London’s Portal Gallery in 1976, exhibiting with them in Chicago, New York and Paris and continuously in London ever since. Portal introduced Lizzie to The Red Dot Gallery, close to her home in Norfolk, in 2011.